Stay at one of the Route 66 hotels in Albuquerque, NM, Old Town when you want easy access to the charming sites and convention center in Albuquerque. The Best Western Plus Rio Grande Inn is conveniently located near several attractions and business sites, making it the perfect choice for leisure and business travelers looking fro a comfortable hotel near Old Town. Enjoy the rich culture and wealth of dining and shopping options within minutes of our property. All of our non-smoking rooms and suites are designed with your needs in mind. Youll also enjoy deluxe amenities including concierge service, an outdoor heated pool and a fitness center featuring a Hoist weight machine and cardio equipment. Enjoy meals at our very own Albuquerque Grill serving Southwestern and American fare or order room service to enjoy meals in the comfort of your room. The Zia Lounge on the property is also open for dinner every day and is the perfect place to enjoy cocktails and good company. Youll find several bistros, modern dining destinations and fast food restaurants within a few blocks of the hotel. If youre here on business, enjoy easy access to the Albuquerque Bio Park, convention center and other downtown business sites. We offer airport shuttle service and onsite meeting space that can accommodate up to 240 guests. Our convenient location near I-40 makes it easy to travel to area offices and downtown entertainment venues during a business trip. Whether youre in town for the International Balloon Festival or want to tour Albuquerque museums, enjoy all the comforts of home at our Route 66 hotel. 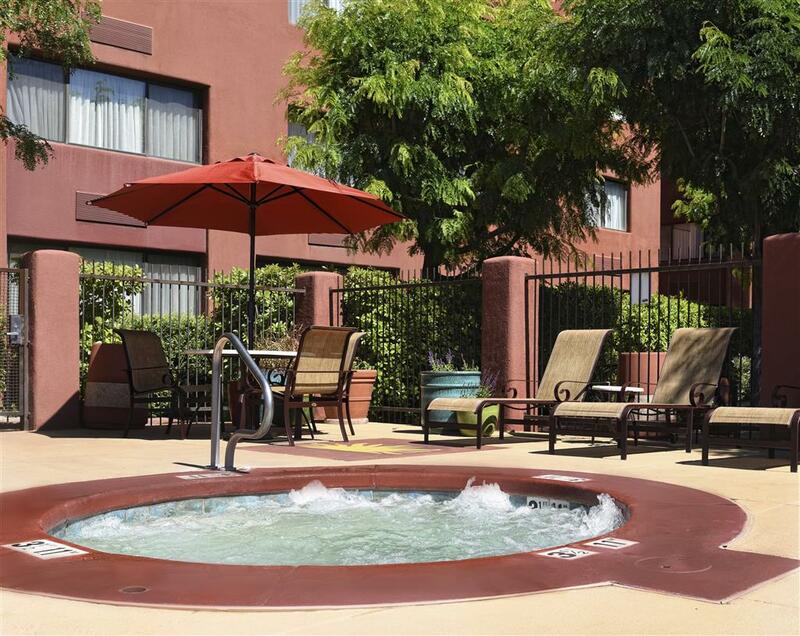 Book your room at the Best Western Plus Rio Grande Inn on bestwestern. com to take advantage of our Low Rate Guarantee. Zia Lounge: Zia Lounge, on premises, Bar/Lounge, American, Open for: dinner, Open 4:00 p.m. to 10:00 p.m. Seasons Restaurant: 0.20 mile(s) from Seasons Restaurant, Full Service, Continental, Open for: lunch, dinner, 11:30 a.m. to 9:00 p.m.
El Pinto: 9.00 mile(s) from El Pinto, Full Service, Mexican, Open for: lunch, dinner, New Mexican, 11:00 a.m. to 9:00 p.m.
Lams Chinese: 1.00 mile(s) from Lams Chinese, Full Service, Chinese, Open for: lunch, dinner, 11:00 a.m. to 10:00 p.m.
Little Anitas: 0.20 mile(s) from Little Anitas, Full Service, Mexican, Open for: breakfast, lunch, dinner, 11:00 a.m. to 11:00 p.m.
High Noon: 0.30 mile(s) from High Noon, Full Service, Steak House, Open for: lunch, dinner, Steaks, pasta and seafood, 11:00 a.m. to 11:00 p.m.
Texas Land and Cattle Ste: 6.00 mile(s) from Texas Land and Cattle Ste, Bar/Lounge, Steak House, Open for: dinner, Tuesday thru Saturday from 4:00 p.m. to 9:00 p.m.; Sunday 10:00 a.m. to 9:00 p.m.
PF Changs: 6.00 mile(s) from PF Changs, Full Service, Chinese, Open for: lunch, dinner, 11:00 a.m. to 11:00 p.m.
Starbucks: Adjacent to Starbucks, Coffee Shop, American, Open for: breakfast, 5:30 a.m. to 9:00 p.m.
Tucanos: 2.00 mile(s) from Tucanos, Full Service, International, Open for: lunch, dinner, Carribean cuisine, 11:00 a.m. to 10:00 p.m.
High Finance: 15.00 mile(s) from High Finance, Full Service, Continental, Open for: lunch, dinner, 11:00 a.m. to 9:00 p.m. Outdoor pool - Outdoor pool Heated Pool converts to a heated "domed" indoor pool between the months of November through March. PNM,2.00 mile(s) from PNM, Energy Service Co.
Botanic Gardens,1.00 mile(s) from Botanic Gardens, Explore over one and a half miles of paths through formal and whimsical gardens designed to delight your senses. Albuquerque Aquarium,1.00 mile(s) from Albuquerque Aquarium, Part of the ABQ BioPark. Located next to the Rio Grande in Albuquerque, New Mexico. Take a journey down the Rio Grande from Albuquerque to the Gulf of Mexico, visiting aquatic animals along the way. Balloon Fiesta Park,10.00 mile(s) from Balloon Fiesta Park, Balloon Fiesta Park is home to the spectacular annual Albuquerque International Balloon Fiesta, as well as the Anderson-Abruzzo Albuquerque International Balloon Museum, and the Golf and Event Center. Rio Grande Zoo,2.18 mile(s) from Rio Grande Zoo, Located next to the Rio Grande in Albuquerque, New Mexico, the 64-acre Zoo has been offering guests close encounters with exotic and native animals since 1927. Cliff's Amusement Park,10.00 mile(s) from Cliff's Amusement Park, Cliff s Amusement Park, Albuquerque, NM s premier theme park, offers the WaterMania! Water Park, great fun the whole family, and more.